Virgil’s Aeneid – Poetry or Propaganda? Towards the end of Book 6 of the Aeneid, Anchises (Aeneas’ dead father), whom Aeneas is visiting in the Underworld, shows his son that his descendant, Romulus, will found the city of Rome – a city that will ultimately be governed by the Emperor Augustus. Now bend your gaze this way, look at that people there! Posterity, who shall pass beneath the arch of day. In much of the poem there are obvious parallels between Aeneas and Augustus, but in this passage the device is abandoned in favour of something altogether less subtle and strengthened by the weight of destiny. After his victory over Mark Antony at Actium in 31 B.C., Augustus went on to restore peace in Rome after a century of civil war. The obvious parallel in the Aeneid is that Aeneas is seeking to continue the Trojan line out of the chaos of a ruined Troy. 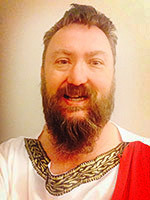 There are certain human characteristics required in order for Aeneas to fulfil this destiny in spite of distractions (the love interest in Queen Dido of Carthage in the earlier books) or hostilities (most obviously, the military opposition in Latium culminating in the killing of Turnus at Aeneas’ hands). The most important of these characteristics is pietas (meaning pious duty). This is shown early in the poem when Aeneas carries his father away from a burning Troy, but the pietas goes far beyond the filial and is shown both in the hero’s attention to religious matters (where he is subservient to the divine and fate) and in affairs of state. An important initiative during Augustus’ rule was his effort to restore traditional morality and Roman-style family values. This aspiration for Rome is reflected throughout the poem, most of all through the depiction of the pious and dutiful Aeneas himself. Augustus supposedly intended to restore rule to the Senate once the political situation in Rome had stabilised, an intention that never materialised. Aeneas’ son (Ascanius) is renamed Julus in the poem, lending a legitimacy to the newly fledged Julian dynasty. However, to characterise the epic as no more than Augustan propaganda would be misleading and does Virgil an injustice. An indication of its quality and durability is its continued place as a stalwart of Western literature and the lasting influence it had long after Virgil’s death. One particular point of interest is the tradition that Virgil, who died from a disease while travelling in 19 B.C., gave instructions that the Aeneid be burned – a wish overturned by the Emperor. This has given rise to much debate as to whether the work was fully finished, and to whether the poet’s wish amounts to his rebuttal of its apparently pro-Augustan standpoint. The Aeneid, read by David Collins in our new recording, uses Cecil Day Lewis’ 1963 translation which is written, like the original, in hexameters. The poem’s twelve books break down conveniently into two parts: Books 1–6 cover Aeneas’ journey to Italy, and Books 7–12 cover the struggles in Italy with the people of Latium. In a sense, the narrative of the first half of the work echoes Homer’s Odyssey, while that of the second echoes his Iliad – although this comparison has its limitations. 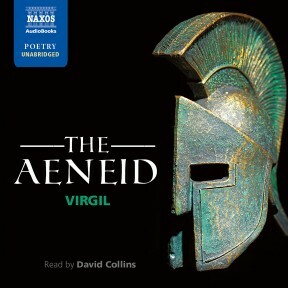 Tradition has it that Virgil recited at least some of the books from the Aeneid to Augustus and, like much poetry, it was often recited for public consumption, a tradition upheld by the audiobook medium of today.